There wasn’t much spring in Caterpillar’s step today, considering the magnitude of yesterday’s sell-off, but things could’ve been far worse, considering that oil futures dipped into the $35-and-change range. Full quote at Yahoo Finance. Major indexes arrived for work today, but didn’t get much done. Dow, up 0.64%; Nasdaq, up 0.38%; S&P 500, up 0.8%. Wrap-up at Market Watch. Cat’s volume was about 18 percent below average at 10.4 million … could that signal relief from the punishing volatility of late? We can only hope. Word arriving late in the afternoon that a stimulus package agreement is at hand produced barely a whimper. Feels like we’re sitting at a pivot point; I have no hunches where thing are going, so it’s better to keep my yap shut at the moment and be suspected of idiocy than to say something that removes all doubt. Paul Gordon of the Journal Star notched a scoop this morning: a source is saying Caterpillar CEO Jim Owens will promise at tomorrow’s Obama visit in East Peoria that recently laid-off workers could be rehired if a federal stimulus act passes. Owens, who will fly into Peoria on Air Force One with the president on Thursday afternoon, will encourage passage of a “significant stimulus package” in the United States and will offer his and Caterpilar’s encouragement for other stimulus packages being considered around the world, said a source familiar with the plans for Obama’s visit to Peoria on Thursday. If the packages are adopted and enacted quickly, it would give Caterpillar the opportunity to begin recalling those employees who have already been laid off since early December and like stave off planned near-term layoffs. Cat has not changed its mind about the plants in North Little Rock, Arkansas, and Sequin, Texas. Jobs eliminated because they’re moving to these locales will most likely stay gone. The stimulus package could spike demand for construction and power equipment, but demand for mining machinery would be farther down the road. Cat people in construction and finance could benefit sooner. I’m still in wait-and-see mode on what gets said at Thursday’s visit. Cat is letting people go because demand is way off and it’s pointless to build machinery and let it stack up in a lot somewhere. Many of the people laid off would get rehired when the economy turns around; the stimulus package simply hurries things up a bit (potentially). Honest question: how reliable is Gordon’s source? Well, given Cat’s Fort Knox mentality about guarding company information (and carefully telling only what it wants known), it’s safe to assume this was an approved leak. I can’t imagine anybody talking to the press without authorization when the company’s looking for reasons to reduce expenses. PEORIA, Ill., Feb. 11 /PRNewswire-FirstCall/ — Caterpillar Inc. (NYSE: CAT – News) today announced it is offering a voluntary early retirement incentive package to approximately 2,000 production employees in Illinois Caterpillar facilities (Aurora, Decatur, Joliet, Pontiac and the Peoria-area) as well as in Denver, Colorado; Memphis, Tennessee; and York, Pennsylvania. This company-initiated incentive is being offered in accordance with Caterpillar’s Non-Contributory Pension Plan. Eligibility for this package is based on a combination of age and credited service. The incentive plan announced today is in addition to other previously announced workforce reductions related to production employees. Consistent with previously announced plans, and depending on business conditions, more voluntary and involuntary workforce reductions may be required as the year unfolds. Hmm. let’s see, my 401(k) is down 40 percent so, yeah, I want to retire as soon as possible to start cashing in my winnings. I posted a few questions about Caterpillar from an investor’s perspective at Heavy Equipment Forums and got some insightful replies. What really, truly sets Cat apart from the crowd? It’s not the paint color or the triangle-shaped tracks. SERVICE SERVICE SERVICE. Cat’s got the dealer network and parts stores to keep their equipment serviced and running when down time costs money that matters most. Their field service and support fleet is unrivaled. 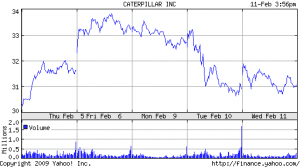 What’s the first thing Cat should do to improve its stock price? That’s one of my pet peeves about corporate America in general: too much pressure from the shareholders wanting instant gratification with ZERO foresight into the future. Right now I think Cat should be focusing on INNOVATIONS and improvements to the existing product catalog. There’s not a whole lot they can do besides try to stem losses in the current economic climate. Caterpillar got trampled Tuesday as Wall Street showed blood-red displeasure with both the U.S. Treasury secretary’s paint-by-numbers scheme to save the banks and the U.S. Senate’s gazillion-dollar scheme to save the rest of the economy. Full quote at Yahoo Finance. Indexes looked like the floor of a MASH operating room: Dow, down 4.62%; Nasdaq, down 4.20%; S&P 500, 4.91%. Wrap-up at Market Watch. Caterpillar’s volume of 17 million shares was about 30 percent above normal, not good but not nearly as ugly as some of the days we’ve seen since the Q4 earnings report. Large moves to the downside are more typical at the beginning of a bear market than the middle, when the slope-of-hope grinds on for months. Today’s bloodbath could be a sign of worse days to come, or it could simply be a profit-skimming correction of the rally of the past couple weeks. Perhaps traders bought the rumors and sold the news, as they’ve always done. Traders slammed the Dow this morning, apparently disappointed that a Messiah did not spring from the head of Timothy Geithner and declare that good times are just around the corner. Actually, the indexes bounced to the same place in their trading range last week where sell-offs have ensued every time since last September. Strength getting sold in the midst of a bear market? Who’da thunk? Actually this AP story reveals what really happened: the Treasury secretary said nothing new — implying uncertainty over the strength of the financial industry endures — and one key economic indicator tanked, giving everybody a ripe excuse to cash last week’s profits. The Commerce Department said wholesale inventories plunged by 1.4 percent, nearly double analysts’ expectations of 0.8 percent. It also was the fourth straight monthly decline. Unfortunately, headline risk doesn’t go away till the news starts getting better. 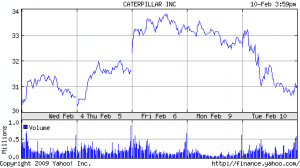 NASCAR: How much bang does Caterpillar get for its sponsorship buck? Caterpillar is among the prominent NASCAR sponsors that have to be asking themselves how much they really need to spend keeping racing teams afloat, especially in light of this Forbes magazine article highlighting just how far NASCAR has fallen from fan favor in the past five years. The woes: Cars look the same. Drivers look the same. Races look the same. And NASCAR is tightly controlled by the family that owns it. Team owners assume the lion’s share of the risk by investing heavily in people and equipment but get a pittance from broadcast revenue and none of the ticket sales, which go mainly to the track owners. It can cost $10 million to recruit a winning driver and $25 million a year to race one car. Most teams raced two or three last year, and 90% of their operating budget came from corporate sponsors. The rich sponsorship deals signed during the fat years earlier this decade are expiring, and new sponsor money is drying up. Domino’s Pizza, a primary sponsor of Michael Waltrip Racing, and Eastman Kodak, a sponsor of Penske Racing, threw in the towel after last season. Also gone are Coors Light and Tide. Sponsors still committed to the sport, such as Caterpillar, Diageo and UPS, are flocking to winning teams or spending their money at the track. Winning brings in money, and the money funds the ability to win. The haves are pulling away from the have-nots. The four richest racing teams filled all 12 positions in the sport’s Chase for the Cup playoff format last year. Most of the 43 drivers at this weekend’s Daytona 500 will start their engines knowing they have a slim chance of cracking the top 10. Some won’t even bother to complete the race. Teams are folding, merging or taking bailouts from plutocrats. Seven-time NASCAR champion Richard Petty sold his Petty Enterprises team last year to the private equity firm Boston Ventures because he could not raise enough sponsor money. (Boston Ventures recently sold Petty’s name to the team owned by multimillionaire businessman George Gillett.) In 2007 Jack Roush sold half of his team to Fenway Sports Group, a firm controlled by the company that owns the Boston Red Sox. Morgan-McLure Motorsports shut its doors last year after 24 years on the circuit because of a lack of sponsors. Ditto Bill Davis Racing. Team owners want a franchise system like pro baseball and football teams have. NASCAR says no dice. Sponsors have lots of sway in pro racing … can’t help speculating that Cat and its brethren might have something to say about whether the team owners get what they want. Cat sponsors Richard Childress Racing with Jeff Burton in the No. 31 Chevrolet. Cat’s racing page is here.